Thud! That awful sound of a bird hitting a window. What comes next? So many times these situations end badly, which is why we love a feel-good story. This beautiful Northern Flicker hit the window of a Family Dollar store in Beacon, NY. She was spotted and rescued by Michelle Basignani, who put her in a box in her car and called her friend Daniel Cronk. Daniel called his brother, Dylan Cronk, who called his friend Skye Horgan, whose mother is a wild bird rehabilitator (me). Do you see how these wildlife rescue stories go? It takes a village. Since I’m on bird sabbatical right now I called Lia Pignatelli, a very skilled songbird rehabber in Westchester County, NY. She said she could take the flicker if someone could transport her, so Michelle brought the bird to Skye, and Skye and Dylan drove almost 90 minutes round trip to Brewster, where Lia works. 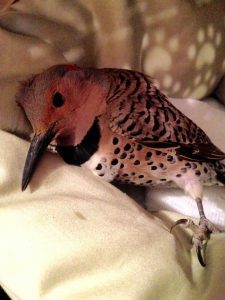 The poor flicker had severe neurological symptoms: eyes closed, unable to stand, torticollis (head bent to the side). She couldn’t eat on her own, so Lia had to hand-feed her mealworms hourly for two weeks. Each morning Lia would find her lying on her side, propped up by towels, eyes closed. Lia would say “Good morning,” the flicker would open her eyes, and Lia would open the flicker’s beak and feed and hydrate her. Flickers are difficult birds to rehab, as they tend to stress out and start thrashing and rolling. But not this one. Here you can see how severe her head tilt was. Lia gave her very gently daily massages on the contracted side to help her recovery. Her legs improved, and she began sitting up on her own instead of leaning against the towels. Then she stood, even though her head was still tilted. For a few days there seemed to be no progress at all, then one day she started eating on her own. She grew stronger and stronger, and eventually could cling to the side of her crate. And then … drumming! She was moved to a larger enclosure until all her neurologic symptoms were gone, and then to a flight cage where she could fly and regain her strength. Lia and Skye met in the parking lot of the Family Dollar store to release her. It wasn’t exactly prime bird habitat, so they scouted the area across the street and found a beautiful wooded valley with a brook, alive with birds. Skye manned the video camera, Lia opened the door, and the flicker rocketed out and into the woods. From intake to release was a little over a month. All photos and videos by Lia Pignatelli, except final by Skye Horgan. Thanks for again bringing us into the Rehabbers world, we appreciate your wonderful work. Just curious how you know that fine line between “ready for release” and “stayed too long,” which I’m assuming would lead to dependence. It sounded like this bird was a goner, such a happy ending, and reminded me that my window decals need refreshing right about now. 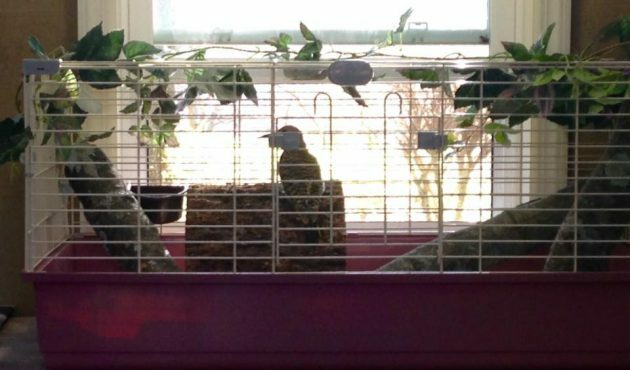 Thanks for a happy ending for a beautiful bird! Thanks, Wendy! Love those happy endings! Hi Barb, there are all kinds of criteria rehabbers learn when it comes to keeping or releasing a bird. It’s really difficult, because it’s never set in stone. You have a bird who is more than ready and needs to be released before he damages his feathers or hurts himself, but a tropical storm is on the way. Or you have one who is not quite ready, but if you don’t release him he’ll miss migration. We are always agonizing about this, as well as 1000 other things. That’s why a story like the flicker’s is such a joy. Thanks for keeping up those decals! Where Are You Birding This First Weekend of June 2016?